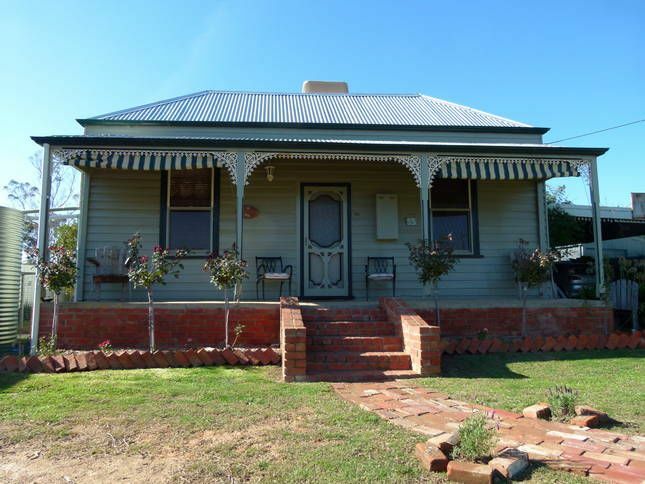 Lovely private three bedroom weatherboard cottage on the high side of the main road into town. Our accommodation offers you a relaxing stay for a romantic getaway or family holiday with all the comforts of home. The main bedroom sleeps two comfortably and contains a beautiful double art deco bed, wardrobe and dressing table. The second bedroom contains a double bed and a single and the third bedroom has an antique, extra long single bed and a double pull out couch bed. Roses On Derby is very child friendly with a fully fenced backyard as well as a fenced front yard with lots of delightful places to sit and take in the views from the slightly elevated block. Enjoy sunny afternoons on the front veranda with a glass of wine whilst watching the children play or just taking in the surrounds. Your pets are also very welcome but must remain outside at all times. Close to all amenities and local attractions. Roses On Derby is only a short walk to High street for all of your shopping needs with Maryborough Highland Club and Peppers restaurant only 1km away. It is also well situated for those wanting to attend the RACV Energy Breakthrough event (Nov) but not too close to be affected by noise and traffic restrictions. Thanks so much for your wonderful feedback Donna. I’m so pleased you enjoyed your stay. Clean, well maintained and fitted with all the comforts. Loved the furniture and decor. Quite neighbourhood. Great communication. Thank-you for your lovely review of my cottage Harminder. It was a pleasure to have you stay. Sam. We all had a lovely time staying here, plenty of space for our son to play out the back and each room was set up perfectly for us. So nice to have everything you need on a weekend away and this place had it all. Thank-you so much for your review Bek. It was a pleasure to have you all stay. I'm so pleased you had such a great time. Roses On Derby is a very charming period style home with all the comforts. Especially good if travelling with pets. Highly recommend this stay. This was on the main road, but you wouldnt know. Tidy and comfortable, just needs queen size bed!